At Tenants.com we have lots of help for tenants. Here you can find books, dvds, and other resources to help you with your time as a renter. You might be surprised that as an informed renter, you may be able to coax concessions from your landlord, develop a great working relationship, and bargain to get the lowest rental rates. You just need to be informed, and these tenant resources can help. First, as a tenant, you REALLY should check out our very own eBook for renters! It contains over 70 PAGES of helpful advice, tips, and information for anyone that is in a rental property. Just complete the info on the left side to get your very own copy! We have found that when you have the tenant resources that you need, you make better decisions and develop a better relationship with your landlord. You don’t always need a lawyer to interpret your lease if you take the time to learn what to look for and what the legal terms mean. Learn how to negotiate with your landlord or even potential roommates. Information is the key to understanding the responsibilities of your landlord and their obligations to you as a tenant. Plus, when there is a conflict or misunderstanding, you will know your rights and legal options as a tenant. 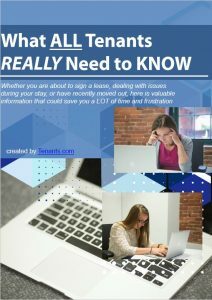 At tenants.com you will find the tenant resources that you need!